If you were wondering when (or if) Apple had plans to update iWork for the Mac, Tuesday October 22 was an amazing day. Along with the expected release of new iWork apps for iOS, Apple released new versions of iWork for the Mac. Each of these apps is designed to offer easy access to and editing of your documents no matter what device you’re using—and that includes PCs. After working with these updated versions of Pages for the Mac and for iOS, as well as the Pages in the iCloud beta, I’m happy to report that there’s a lot to like about the latest editions of Apple’s word-processing apps. Pages now offers collaborative document editing, seamless synchronization between platforms, and a single document format for all platforms. While I wasn’t able to test these features in any depth, my initial impression is that the apps and their documents all play really well together. If you’ve been playing with Apple’s iCloud beta, Pages for Mac is going to seem like familiar territory. It is the Web app’s doppelgänger, with more refined features and a brand new look that, while familiar, is definitely different from its predecessors. Gone are toolbars at the top of the screen for formatting text and other objects, which have long been a staple of GUI-based word processors. What remains is a toolbar you use to insert a variety of objects into your document and to change the way you view the document you’re working on. For formatting text, Pages now uses something called the Format Inspector: A small sidebar that changes contextually depending on what you’re working on. The Format Inspector replaces the old floating inspector, which I always found necessary when using Pages, but which I also found annoying because it often got in the way of my work. So when you’re editing text, you get tools for formatting text. When you’re adding tables, a table tool appears. Inserting charts? Chart formatting options appear. My immediate impression is that this new way of formatting text and other objects in your document is a significant improvement over any previous versions of the app. 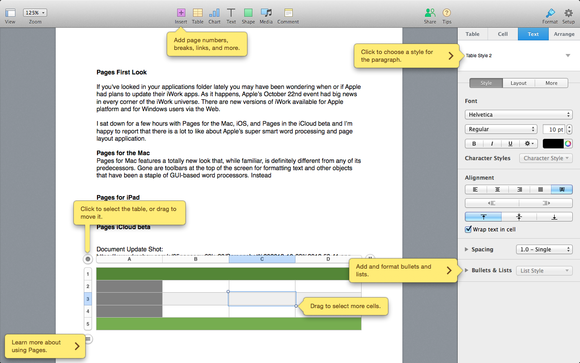 Pages for Mac’s compatibility with all other versions of the app may come at a price. iWork ’09 had two distinct document-editing paradigms; one for word processing and the other for page layout. It appears, at least initially, that Pages no longer offers a distinct page-layout option. This isn’t to say that you can’t create complicated brochures and newsletters using the app—you can. But if you are currently using Pages’ page-layout features, you’ll want to make sure you’re not using features such as text-flow before you upgrade to the new version of the app. I’ll investigate this in more detail over the next few days. 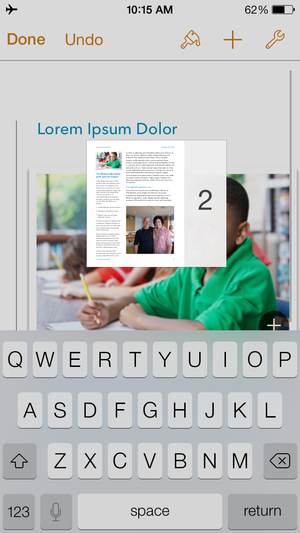 Yeah, it's tiny, but the iPhone version of Pages offers the same editing capabilities of the Mac and iPad versions. One of the problems with earlier versions of Pages for iOS was its inability to edit anything created on your Mac if it was anything more complicated than a basic word-processing document. Apple has now promised document compatibility across all versions of the app; in my initial testing, those promises seem to be fulfilled. After creating several types of documents on my Mac and opening them on both my iPhone and my iPad, I have seen none of the cross-platform “issues” I experienced using iWork ’09. The transition between apps seems seamless. And changes made on one device update almost immediately on all other devices. Pages on the iPad remains a small wonder. It is every bit as easy to use as the Mac version of the app, and may be the only word processing app you need. And since it now offers all the features available using the desktop version of the app, you really have no reason not make the iPad your one stop for all your document editing needs. Pages on iCloud has been updated to allow collaborative editing, but some features haven't been implemented yet. Little has changed with the Pages iCloud beta since I first looked at back in August. The Web-based app offers excellent editing tools and gives you access to all of your iWork documents whether you’re using a Mac or a PC. And what a lot of people don’t realize is that you do not need to be using a Mac or iOS version of any iWork app to take advantage of the Web-based applications. All you need to have is an AppleID. The biggest obvious change to the iCloud beta is that it provides real-time synchronization with documents being edited by anyone using Pages for iOS or the Mac. And it can be used when collaborating using Pages, which (as mentioned earlier) works seamlessly. So what's not to like? Pages seems like an excellent update on all three platforms (Mac, iOS, and Web) that, with the possible exception of missing standalone page-layout tools, promises to make creating beautiful documents simple, no matter what device you're using. While this is version 5, the new Pages is really a brand new Mac word processing and page layout app—and chances are, it's not yet what you need.